Place Farro in a saucepan covered with lightly salted water by a few inches. Bring to a boil. Reduce heat and simmer 25-30 minutes, or until tender. Drain and cool (can be done a day ahead). Combine eggs and sesame oil; set aside. Lightly coat a large non-stick pan or wok with oil and heat to medium-high. Add garlic and white part of green onions; stir-fry about 10 seconds. 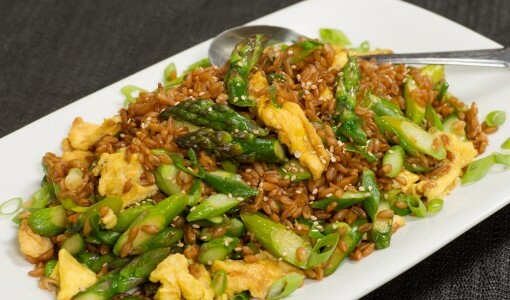 Add asparagus; stir-fry about 30 seconds or until bright green. Add cooked Farro and toss until warmed through. Push Farro and asparagus aside to one half of pan. Add a little more oil to empty side of pan and add egg. Do not disturb until almost set. Stir into Farro, breaking egg into pieces. Toss in remaining green onion and season very lightly with soy sauce. Garnish with sesame seeds and serve hot. This dish readily accepts variations! Add whatever fresh vegetables are in season. Try kale, shredded carrots, summer squash, cabbage, or fresh green peas.